BIG JOB: James Menzies will be crucial to Marshall's finals chances this weekend. 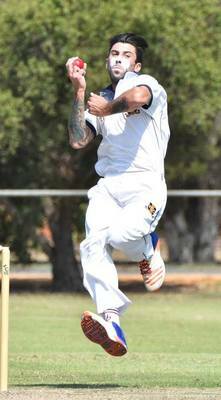 Geelong Cricket Club has charged through to the preliminary final in two weekends’ time after disposing of Essendon in clinical fashion last weekend. The Cats travelled to Windy Hill and were sent in by their hosts, a decision that looked sound early on as the top order crumbled to be 2/25 early on. However, Hayden Butterworth (73) showed his maturity with a fine counter attacking innings. He was well supported by Josh McDonald (57) and Tim Ludeman (43) as the side posted a very competitive finals score of 273. In reply, the Bombers top order got off to a good start, reaching 2/91 and then 4/166 as they looked to be heading to a big win. But Brenton McDonald (5/76) stood up when it counted, as he has so often this season, and dragged his side back into it to bowl out the hosts for just 211, earning Geelong week off in the process. With a home preliminary final to look forward to in a fortnights’ time, the well-rested Geelong side will be primed to having a shot at progressing to the grand final. Meanwhile, it’s finals time in Geelong Cricket Association, and in division one two mouth-watering semi-finals are scheduled. East Belmont will take on St Josephs at Leopold, while Grovedale takes on Newtown & Chilwell at South Barwon. East Belmont has dominated all season, losing just the one game to Lara in a match where a host of its stars were unavailable. That all counts for nothing now though, as finals are a whole new ball game with no second chances. East Belmont will know that and will be sure to up its game to a new level. And it will need to as well because as St Josephs boasts some genuine match winners, many of whom have performed on the big stage of finals in the past few seasons. For the Lions, Sean O’Neill will be key with the bat, while Chris Williams topped the bowling table for the season with 42 wickets and will be pushing for more. St Josephs’ strength probably lies in its batting, with Leigh Kentish and Andrew Hodgson leading a dangerous top order. If their bowlers can put enough pressure on the deep East Belmont batting line-up, this game might be tighter than many suggest, although the Lions deserve to start favourites. Meanwhile, Grovedale’s finals experience will see the Tigers start narrow favourites against Newtown & Chilwell. With battle-hardened players like Barry Tsitas and Gareth Yelland steering the ship, the Tigers will never flinch. On the other hand, the Two Blues’ form has been patchy. There’ s no doubt their best is good, though, but they don’t seem to produce it enough, particularly with the bat. If they can post a competitive total their bowlers may get the job done. But Grovedale should have too much depth and experience and will be the narrow favourite in a danger game. In division two, Murgheboluc has been the team to beat all season and will get the chance to show that tomorrow when it plays Marshall at Marshall. The Frogs have been lead outstandingly by Grozdanovski brothers Michael and Jason all season but also have a number of players in form at just the right time. Marshall, on the other hand, has been almost a one-man team all season, with Corey Walter continually shouldering the load with the bat. It’s just too hard to see how so many Marshall players could suddenly find form all at once, meaning it’s hard to tip them here. In the other semi-final, Bell Park will play Torquay at Manifold Heights. The Dragons will be out to defend their premiership, ironically against the side they drew with in last year’s rain-affected grand final. With players such as Shane Lymer in good form, they will feel they are a good chance. Torquay, though, is a very good side with plenty of depth. The Tigers have shrugged off their off field controversies to finish second on the ladder and will be out for revenge. If both sides play to their best, they may well get it too. And in division three, the race is wide open, with all four sides competing in the finals having genuine claims to be the eventual premier. Modewarre finished on top and will play St Albans Breakwater at Grinter Reserve in Newcomb. St Albans Breakwater was on top itself not too long ago, so ladder position will really mean nothing here. Both sides have plenty of stars, but Modewarre might have slightly more and will start narrow favourites. Meanwhile, Bannockburn will play Alexander Thomson at St Albans. The Bulls have looked world-beaters at times, while they have struggled for consistency at other times. Their best is definitely good enough but the same could be said for Alexander Thomson. This game will be decided by just a few moments, and whoever can snaffle them will win. Gut feel says Bannockburn will just win.